Italy is a major exporter of wine, with a heritage dating back more than 2,000 years to Roman times. It is the perfect setting for European Waterways’ new wine appreciation cruises for 2019 on La Bella Vita, the 20-passenger hotel barge that navigates the Venetian Lagoon and waterways of the Po Valley, a region that is home to some of Italy’s best wines.European Waterways is celebrating its new wine oriented cruises with a 10% reduction on whole boat charters, good on select departures in March, April and May 2019 and when booked by January 7, 2019. Special pricing on whole boat charters for wine cruises start as low as $64,035, making them an exceptional value. Excursions include a ride on a private boat to the island of Sant’Erasmo, where guests will enjoy an exclusive tasting at the domain of Orto di Venezia, Venice’s only winery – famous for the production of Casanova’s favorite wine. Guests will also tour the Renaissance gardens of the 17th century wine estate of Villa Widmann Borletti, followed, of course, by a tasting. The crisp, dry wines grown from the Garganega grape are on the itinerary during a visit to medieval town of Soave, origin of the world-famous white wine of the same name. This wine can be paired with “almost anything” and is one of the most popular in Italy. In addition to the various wine related excursions, there are plenty of other activities on the itinerary, such as a visit to the fishing port of Chioggia and a guided tour of the beautiful 14th century Estense Castle in the Renaissance city of Ferrara. 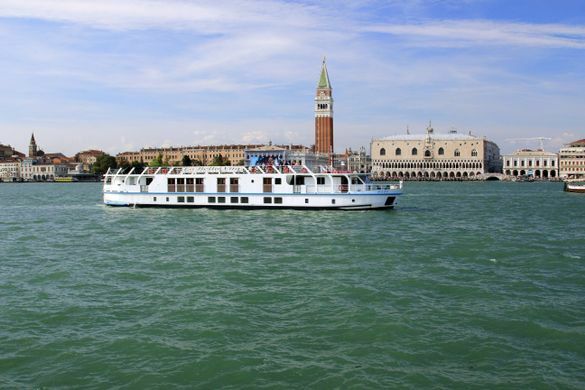 Banks noted that European Waterways is also offering 10% off per cabin on select spring departures for La Bella Vita‘s classic cruises, which feature a similar selection of excursions to historical landmarks. Though the wine tours are less frequent, the cuisine and wine aboard remain exceptional. With this special offer, guests can save up to $1,058 per cabin on select departures in March, April and May, based on double occupancy. Cruises must be booked by January 7, 2019 to be eligible. Hotel barging is a boutique, unique experience which offers an immersive, all-inclusive “gentle voyage of discovery” that focuses upon the culture, history, fine wine and gourmet cuisine of the region. With a 6 to 20 person capacity and 1:2 crew ratio, European Waterways is able to provide an impeccable level of on-board service and can transport their guests on the intimate inland waterways that are inaccessible to larger vessels. This fascinating network of smaller canals allows for flexibility, spontaneity and ample opportunity to hop off and explore the beautiful surroundings via bicycle or on foot. In addition to this are daily, chauffeured excursions “off the beaten track” to a wide variety of enthralling locations, from exquisite wine tastings to private tours of stately homes. With over 40 years’ experience and a fleet that spans nine countries, European Waterways is the largest luxury hotel barging company in Europe. For more information, call 1-877-879-8808 or visit europeanwaterways.com.